Last week I have been improvising with Felipe Ignacio Noriega in Zaal 100, Amsterdam. Just to get inspired, to see where this could lead us. Three excerpts can be heard below. Last Saturday my new composition for the Utopa Baroque Organ at Orgelpark saw the light. After a long development process with many technical hiccups, I was glad all went well. The piece was very well received, and the machines did not fail me. Many thanks to all people at Orgelpark, that beautiful place. The music of KP6-3.7 is a process, a journey and a continuation of the ideas developed for the piece First Law of Kipple composed for the Sauer organ. Using existing material from different media, morphing it unrecognizable, I try to pay homage to my inspirations and at the same time create something entirely new. The new Baroque Organ inspired me to develop my ideas for a hyper-organ into new areas, combining sampled material, analog synthesizer and processed field-recordings with the traditional organ sound to create an instrument that unites the acoustic and the electronic into a whole. 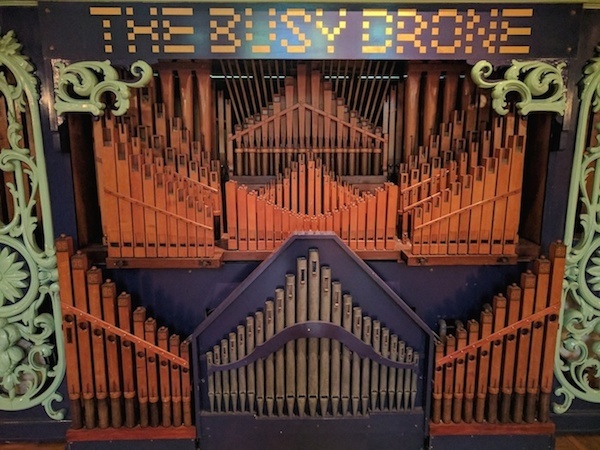 Since the organ was not available for experiments until 4 weeks before this premiere, the piece is not sealed yet, and will continue to be developed. Massimo Ricci of Touching Extremes wrote a lyrical review of Songs of Love (and Decay). "Van Heumen made the most of his technical skillfulness to ensure that nothing sound predictable or stale, and he succeeded. The choice of vocalist Evelien Van Den Broek appears perfect for the scope. The lyrics are rendered with a cross of detached sadness and genuine anger. They talk of hope and disillusion; of processes of growth that had been imagined in a thoroughly different light." The album Songs of Love (and Decay) is released as of today! A special day indeed. The Line Management concert took place at Orgelpark on October 7, 2017. A collaboration with musician/composers Michael Bonaventure, René Huysmans, Felipe Ignacio Noriega, Yung-Tuan Ku and Luiz Henrique Yudo, the evening presented an eclectic mix of new music. I presented three sets there: Automatic consists of 4 short pieces for The Busy Drone, Orgelpark’s Dance Organ. The main role is played by the percussion section and the pieces stress unusual ways of playing this dance organ. The natural sound of the organ is enhanced by electronically manipulated versions. Point-to-Organ is the next version in a series of installation/compositions revolving around the movement of colored blocks on a screen. Guided by the animation of the blocks, electronic and acoustic tones are moving in and out, emancipating from both the Sauer organ, the computer and the Verschueren organ. This version is the most performative one, with the composer controlling the sequence of colors and organist Bonaventure responding to those colors. And finally an improvised set of chains of interaction. Live-coder Noriega interacts with the audience through his code, triggering sounds from the Busy Drone. Van Heumen live samples these sounds and throws them at Ku, who adds bass-drum, snare-drum, metal and cymbals to the percussive sound world. For Sanoma Technology I created the sound of a video trailer. Check out their video's with the trailer here. 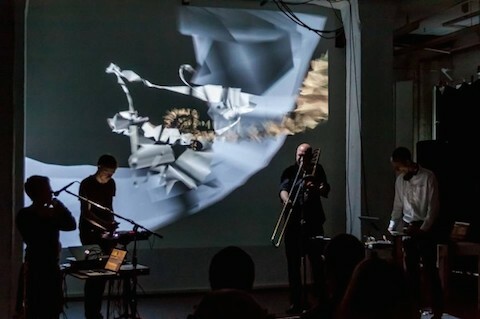 Loop-Copy-Mutate: Music from People and Places is a new project by the Genetic Choir which will yield a year-long series of concerts. Led by singer and artistic director Thomas Johannsen the Genetic Choir will direct our ears towards something urbanites often take for granted: city sounds. Together with laptop artist Robert van Heumen, programmer Stelios Manousakis, and the public, the choir will transform sampled city sounds into voice and music compositions. We recentely did a try-out at TAC Eindhoven, which was very succesful! Recordings can be listened here. Last week I worked for a full day with the Busy Drone, a dance organ located at Orgelpark in Amsterdam. A very interesting instrument. You can listen to some sketches here: AUTOMATIC. Songs of Love (and Decay) is a song-cycle by Robert van Heumen for voice and electronics performed by Evelien van den Broek with financial support from the Performing Arts Fund NL. A series of personal texts about love in a decaying (sound) world. Inspired by Christian Fennesz' Endless Summer and J.M. Coetzee's Summertime. The first song can be listened here. First in many meanings. A week ago I presented the installation/composition Point-to-Line at Museum De Pont, a fabulous modern art museum in the southern part of the Netherlands. I was nice hearing responses on the thing I built. Making some adjustments, below are two video's of the current state. The first one is a live rendition, a composed version, where I was at the controls making decisions on color patterns, which are leading the sound. The second one is where I let the installation run automatically, so any human hand in image and sound progression is purely a result from configuration done in the software prior to running it. Note: due to the screen-capture process the video quality is lower than in real live. Currently I am working on the audiovisual installation/composition Point-to-Line, inspired by the installation Macroworld: One Hours3 and Canned by Angela Bulloch (now on show at Museum De Pont). On January 19 I will pitch my virtual tent at Museum De Pont for a day, presenting Point-to-Line as a work-in-progress. I am very excited for this opportunity! Finally the cementmixer piece saw the light of day! Premiered at De Ruimte in Amsterdam on November 2. I was very happy with the result, it all worked out nicely. Pictures and a video of the full concert can be found on the Parish page. Many thanks to everyone who made this possible: the players (Etienne, Leo, KuTuan and Oguz) and the organisers (Fie Schouten en Robert van 't Veld). Preparing the performance of Parish of Tama, a piece for 6-tet and cement mixer. This will happen at De Ruimte in Amsterdam on November 2. Preparing for Curves, a project from Shackle in collaboration with Männer mit Motoren. In october we will work for a week in Cologne and then play a concert at Stadgarten. Later in November we will perform in Splendor Amsterdam. Watch the events section for dates.
. . . .... _____ Point-to-Line _____ .... . . . is an audiovisual installation/composition, for which I received a stipend from the Performing Arts Fund NL. Inspired by the installation Macroworld by Angela Bulloch, on show at Museum De Pont in Tilburg NL, I am working on this thing and I'm not really sure if it turns out to be an installation or a performance. De Pont expressed interest and offered me to present a work-in-progress in their space. STEIM (my old home-away-from-home) is moving towards sound art, and is also interested in collaborating. A couple of months ago I worked with Margret Wibmer on a soundscape for her installation/performance 'encounters with nature'. The documentation is now online. That's it for now folks. Tune in later for more. O yeah, and listening to Bowie's Alladin Sane album. The man keeps surprising me. My soundwalk Steenklank has a special kids edition this summer. Done twice already, you can bring your kids one more time on August 24 to walk and enjoy the sounds. De P.L.Takbuurt in Amsterdam Zuid is een bijzondere buurt ontworpen door beroemde architecten uit de Amsterdamse School. Bewoonster Sara Luna is je gids op deze wandeling door de buurt. Ze laat je haar favoriete plaatsen zien en bijzondere huizen met mooie architectonische details. Ondertussen luister je naar verhalen over de buurt vroeger en nu. Wat is er leuker dan met kinderen Amsterdam ontdekken? Wil je met met je kind, kleinkind, nicht, neef of de kinderen van de buren de stad opnieuw ontdekken? Schrijf je dan nu in voor één of meer van de 12 geluidswandelingen die we in juli en augustus aanbieden in samenwerking met Mocca Amsterdam. Shackle is collaborating with Männer mit Motoren on a new project called Curves. We are applying to EMPAC in Troy US for a residency and we will embark on a tour to Chili South America in the fall of 2017. Very exciting! On June 7 Shackle played another Affair in Amsterdam's Zaal 100. Guests were Etienne Nillesen and Nicola Hein from Cologne, and our own Oguz Buyukberber. Anne also played a great version of Untitled For Anne and Nicola and I performed Detuning Guitar. All sounds on this website are licensed under a Creative Commons License. 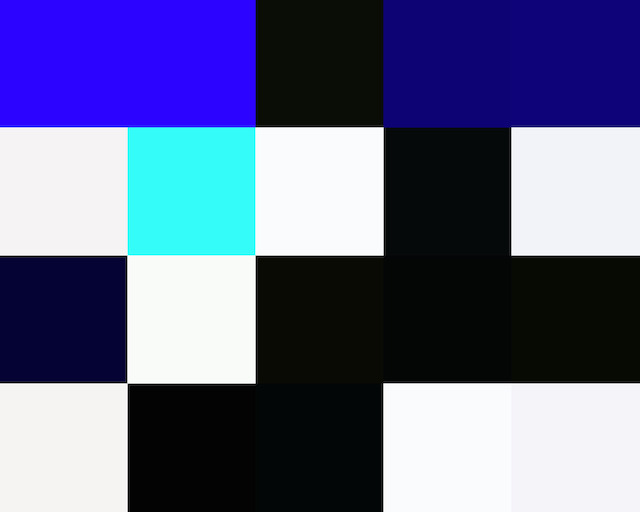 Subscribe to this blog's RSS feed.